Rebranding is a major change for a company. It requires a lot of work to pull off. One important step to take is replacing your old logo or company name, which means you have to alter everything from stationery to your office décor. Switching out the window film in your building is an excellent way to move forward with your re-branding strategy. Rebranding is undertaken for a variety of different reasons; if done correctly, it can help a business appeal to new customers, remain relevant in a dynamic economy, or recover from major disasters. The main reason for rebranding, though, is because a company is looking for a fresh start. If you have altered your company’s logo or gone through a name change, then it’s important to address every location where the logo appears. This includes the windows of your building, especially those at the front entrance. As the first thing that customers and other visitors will see when they enter the office, the windows are an excellent place to showcase your brand and make a great first impression. Ensuring that your name and logo are up-to-date, even after a recent rebranding, will go a long way towards establishing your professionalism and attention to detail. 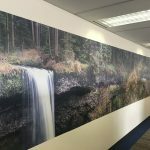 If you don’t already have window film in place, then a corporate rebranding is an excellent opportunity to have some installed, adding a new dimension to your company. While it’s important to make an impression on your clients, another major part of rebranding is adjusting company culture and getting all of your employees on board. This is why it’s a good idea to make sure that the interior of your office is well-branded, even in areas that customers are unlikely to visit. Interior doors and windows, especially in places such as meeting and conference rooms, are a great place to use window film. Displaying your new logo prominently in areas that employees frequent helps instill company pride and a sense of brand alignment. 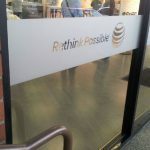 Window film is an excellent choice for rebranding strategies. With a wide variety of colors, frosts, and shades to choose from, you can accommodate nearly any logo, allowing you to move forward regardless of the direction your company is heading. In addition, window film is much more cost-effective than decorative glass and is simple to install, making it ideal for quick changes and struggling businesses. To learn more about how decorative window film can help your company’s re-branding, contact Pacific Window Tinting today.